We all want better, cleaner teeth and gums, but we shouldn't have to sacrifice our health to get them. Most commercial toothpastes are jam-packed with dangerous compounds including fluoride, triclosan (one of the chemicals just banned by the FDA), artificial sweeteners like aspartame, and even propylene glycol which is an organic alcohol used to make diethanolamine. Yuck. Scientific studies have indicated that all of these can have dangerous side effects. 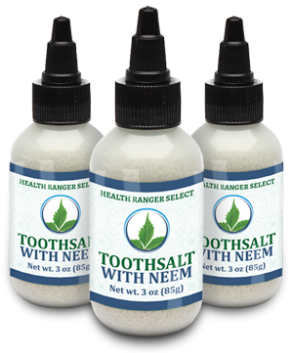 That's why we've developed our Health Ranger Select Tooth Salt with Neem. 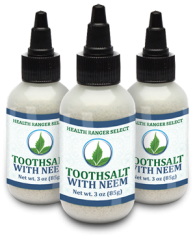 It's the 100% all-natural alternative to chemical-laced commercial toothpaste products that are loaded with toxic chemicals. So, what exactly do we put in our tooth salt? Only genuine, health-promoting ingredients that nourish gums and help promote positive oral health. Oral health is vitally important for your overall health. Poor oral health not only leads to cavities and loss of teeth, it can also cause some very serious medical problems. As every dentist knows, prevention is the key, and taking care of your tooth and gum health is the best place to start. Nearly all commercial toothpastes contain fluoride, which a recent study published in The Lancet found to be a neurotoxin. But most people don't know that. They've had it burned into their heads by governments and self-serving industry groups that fluoride is the best thing available to prevent tooth decay. That just isn't true. "I urge everyone to stop using chemical toothpaste products immediately. Stop putting toxic synthetic substances in your mouth where they are quickly absorbed into your bloodstream. 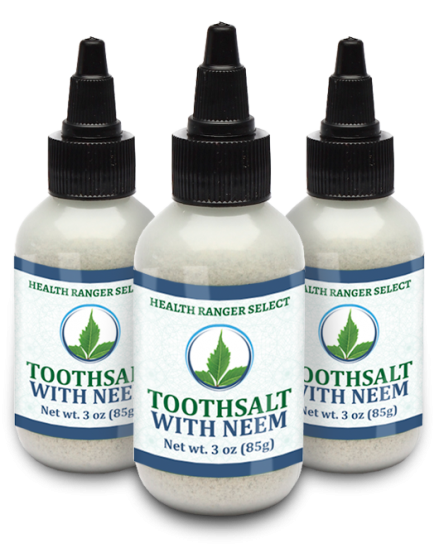 Instead of relying on toxic chemicals, my Health Ranger Select Tooth Salt with Neem is filled with clean, lab-tested ingredients and powerful botanicals with a long established history for supporting good oral health. Use it daily and you'll see and feel the difference!"